Our nature table received a bit of a makeover this week for early autumn. We'll be adding more autumnal bits as the season furthers. What's on your nature table right now? To share bits of nature from your world, see The Magic Onions. thanks for mentioning the honey give away! your fall package is SO adorable...not to mention your nesting bowls. you are a busy lady! I am getting ready to bottle up summer and turn to fall after the weekend. I am heading out of town for work for a few days! thank you for sharing your lovely table! sweet table. i love seeing autumn sneaking in now! ours has fresh flowers, rocks, and sticks on it! i am doing a give-away on my blog today, too. i love give-aways. Well for one thing, we have the same picture as you do. So much cuteness on your table! I love that little hedgehog! The table is beautiful. We have a small pile of leaves that have changed color so far. Love autumn! Cute nature table! I need to get something out on mine, but it's not really looking like fall yet outside. Oh my gosh....We live parallel lives. Guess what we made yesterday in anticipation for our fall nature table? 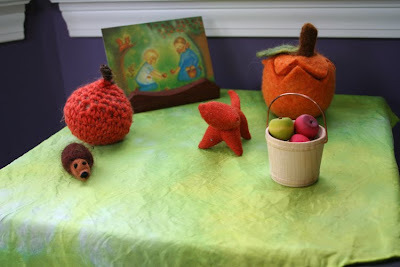 Felted pumpkins! I got the tutorial out of Living Crafts magazine. Your table is looking great. That looks great! Spacify offers wide range of Tables.